ProForm PRO-5000 treadmill is folding type treadmill which is of good quality materials ideal for versatile workout. Its high tech features enables you to be entertained while doing your training and the warranty it carries provide you peace of mind especially when it comes to maintaining it. Storage is no problem as it is a folding type of treadmill and taking much space is also not a problem. 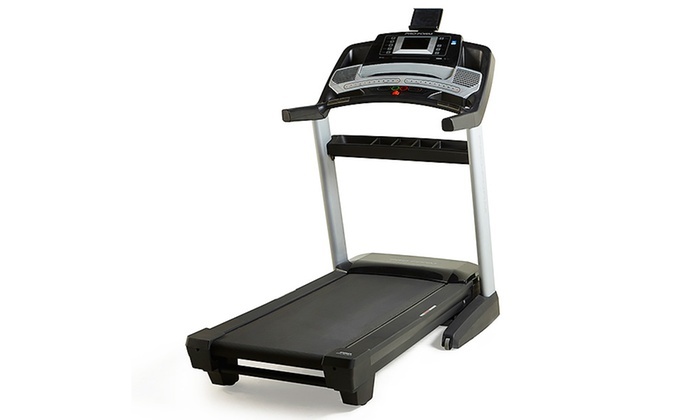 ProForm PRO-5000 treadmill is a well-built foldable treadmill perfect for walkers and runners. If you prefer to run than walk most of the time, then this is for you. The heavy duty motor on this treadmill enables you to exercise for prolonged time and at faster speed. If you are doting of watching or hearing good music while doing your exercise, then the latest 7 inches HD touch screen and iPod compatibility audio are very idyllic for you. This treadmill if one of the folding treadmills from ProForm which is recommended for challenging workout and regular workout as well. It has a high-tech and high powered features ideal for your heavy daily exercises. You can very well concentrate on your health and not worry about repairs or maintenance since this treadmill carries with it a very beneficial warranty. The spacious workout surface and the maximum weight capacity for users offer very flexible options for users or owners. The digital features of this treadmill also provide you comfort in using it and at the same time can provide you entertainment. The iFit feature enables you to find the workout that suits you without the help of an actual coach. Its folding feature enables you to keep or store it without hassle and help you save on some space at your home. Since this exercise running machine is not actually produced in the United States, there are a few situations whereby shipment is not comprehensive. Some parts may be missing and either looking for replacement or asking manufacturer to send missing items may take some time. This is very irritating especially if you want to right away initiate your workout. A few others find the belt a bit flimsy considering the price they paid for it. If you weigh 300 pounds, you may need a stronger belt. Although this treadmill is foldable, the unfolded measurement of 77 inches by 39 inches is too huge for some homes. Based on people who actually have used this treadmill and review from other source, this treadmill is good enough. It may not be the finest there is, but it works just okay. Performance capabilities and durability is provided by the treadmill’s motor which can support your most challenging workout. The latest highlight is the 7 inch touch screen that enables you to surf the web while working out with one of the workout apps incorporated to it. It has an ultimate speed of 12MPH which is appropriate if you want a more dynamic type of workout. The 38 workout programs support your desire for various types of exercise. The discounted price of $1,458.36 is somewhat a good price for a durable and spacious treadmill such as this. However, I would still encourage you to check out my other reviews on similar models in order for you to make a more or less sound decision. After all, over a thousand dollar equipment is not that easy to purchase nowadays. It is at all times best to buy directly from the manufacturer, but there are instances that you can find dependable sellers such as Lazada and Amazon. Check out my other reviews and learn more about where you can make your purchase.